Our speaker will be a representative from the Workers Defense Project. The WDP is a membership-based organization that empowers low-income workers to achieve fair employment through education, direct services, organizing and strategic partnerships. Meaningful, positive change for the workers of Texas. Find out what they are currently working on! Join us Thursday at Sonny Bryan’s, 1251 W Campbell Rd, Richardson, Texas 75080. Visit and Eat at 6:30 pm, Program starts at 7:00 pm. Janna Connolly, Organizational Development Specialist at Texas State Teachers Association, will speak on teacher retention, teacher pay, teacher benefits and labor protections, charter schools, school security. She had a deep CV and is a really good source of information. Don’t miss this meeting. District 12 will have a new City Council Member, as Sandy Greyson is term-limited. Meet the three candidates for this office: Cora Mendelsohn, Carolyn Peadon, and Daniel Powell. January meeting for Dallas County volunteer deputy registrar training. We have municipal elections coming in May, and we will need to register new voters to keep the momentum going! — Suzanne Smith, Candidate for TX Bd. of Education. 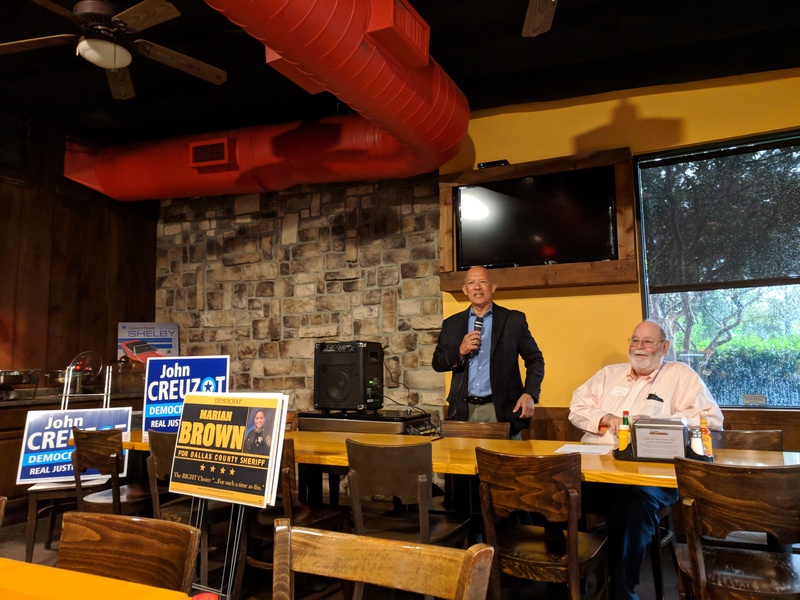 Our guests were distinguished Democratic candidates John Creuzot and Sheriff Marian Brown, who shared their plans for criminal justice reform, building trust between citizens and law enforcers, and lowering crime. 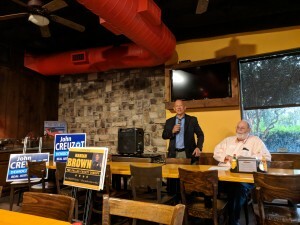 Candidate for District Attorney John Creuzot emphasized the need for criminal justice reform to defeat mass incarceration by treating drugs and mental issues as health problems rather than criminal justice problems and embracing cite & release, particularly in minority neighborhoods. 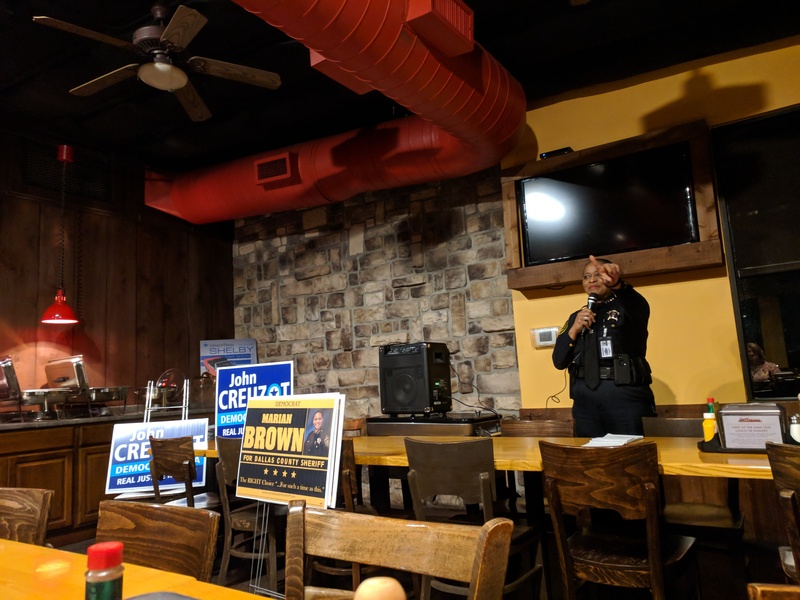 Sheriff and candidate Marian Brown reported on the several programs she has developed within the department to help some of the most vulnerable populations with life skills: inmates, at-risk women, and homeless people. Under her leadership, the sheriff department’s motto is “Integrity out loud, professionalism out front, accountability in all,” citizens are informed and involved, and law enforcers are committed to core values. Staff members on our brilliant candidate Ana-Maria Ramos‘ campaign for House District 102 shared their progress and asked for help. If you want to get Ana-Maria elected, please join the campaign’s Tuesday night phonebanks and postcard parties at Cafe Brazil or Wednesday postcard parties at Panera. They are also in need of poll greeters. 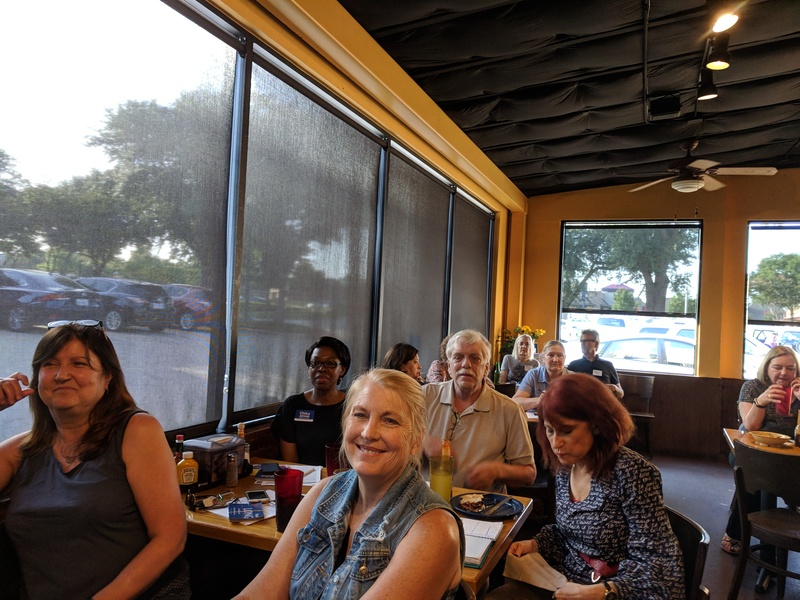 Support Ana-Maria at the Far North Dallas Richardson Dems Block Walk on Saturday, Sep 29 or get in touch with the campaign at Ramos4Texas to find out how you can help! 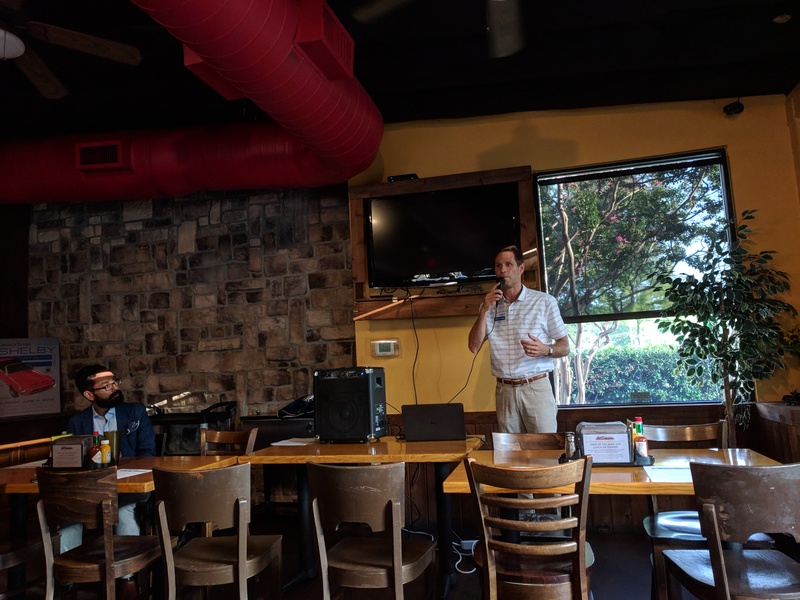 Our board member Zach Bullard gave us an update on the outstanding impact of the DCDP Coordinated Campaign. Your help is needed to reach even more voters! If you want to phonebank, blockwalk, text, or distribute voter guides and slip cards, please come to one of the two Dallas County Democratic Party offices (4209 Parry Ave and Greenville & Royal) and they’ll put you to work. We were joined by Judge Theresa Hawthorne, write-in candidate for the 203rd District Court. 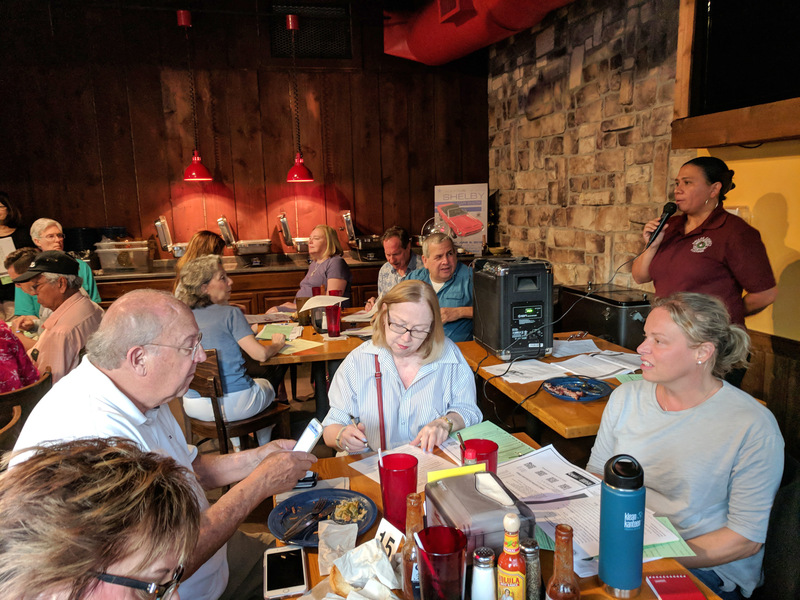 Esmeralda Garcia, Program Coordinator VRO/VDR with the Dallas County Elections Department, kindly attended our club meeting, where she trained and certified 70+ new volunteer deputy registrars! Chris Cambises (RSTX Area Director) spoke to our club about the impact the administration’s policy changes have had on Texas, the largest refugee resettlement state. Even though refugees are rigurously screened and 80% of them are self-sufficient within 6 months of arrival, the resettlement process has been made even more difficult and the refugee admission number, the lowest in history, is being treated as a maximum rather than a goal. 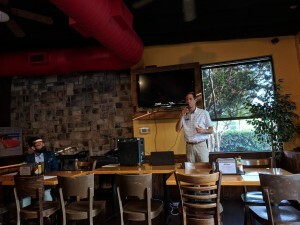 Texas Senate District 16 candidate Nathan Johnson reminded us only two state senate seats need to flip to block the Republicans’ destructive agenda and vote in measures benefiting local communities. 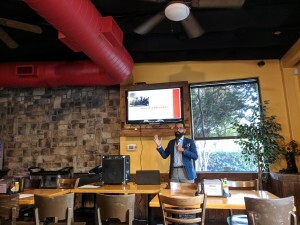 He shared good news about his campaign and the passion and committment of his team, who have been reaching many thousands of voters. Recent polls show Nathan within 1 point of his opponent! We were joined by Mauri Long for Dallas County Justice of the Peace Precinct 3, Place 2 and Chika Anyiam for Judge of Criminal District Court #7. Alexa Garcia-Ditta (NARAL Communications Director) and Emily Martin (NARAL Program Director) spoke about constructive ways to discuss abortion as a personal healthcare decision that should be available and affordable. 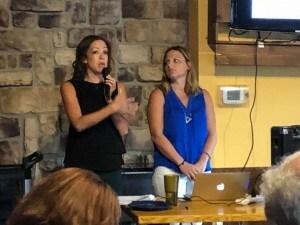 Both speakers underlined the importance of holding conversations from a place of values rather than emotions or hostility, by finding common core values — such as autonomy, fair treatment, recognizing unique circumstances, health and wellbeing — and following up with facts. Find plenty more information and ways to help at prochoicetexas.org. 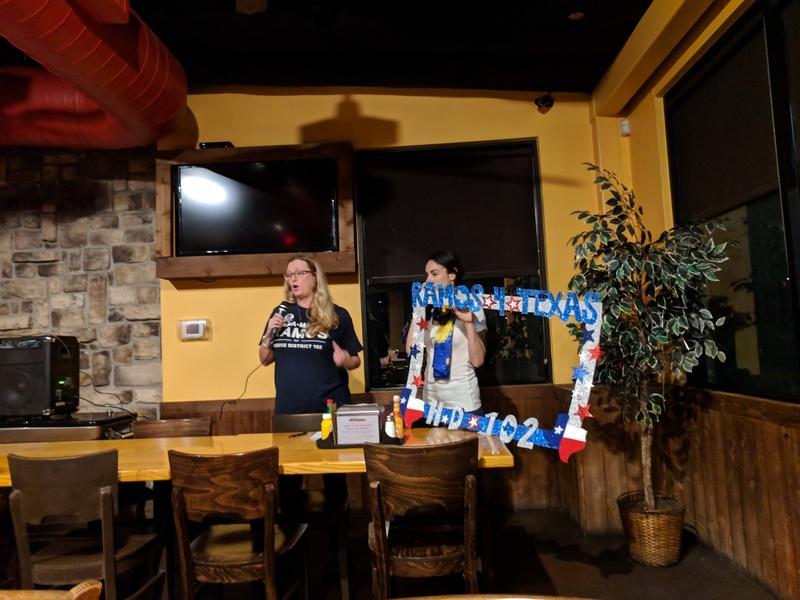 We were joined by Ana-Maria Ramos for Texas HD102, Aly Eber on behalf of Colin Allred for Texas CD32, and Marilynn Mayse for Dallas County Court of Criminal Appeals No. 2. Dallas County Democratic Chair Carol Donovan spoke to the club about the coordinated campaign, which starts after the primary runoff election on May 22 and will work to promote all the Democratic candidates on the general election ballot. 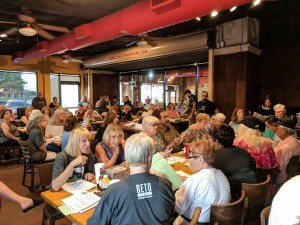 In preparation for the kickoff, the county party has created a development council to reach out to more local supporters and a unity council to help unify the efforts of area Democratic clubs and Resistance groups. 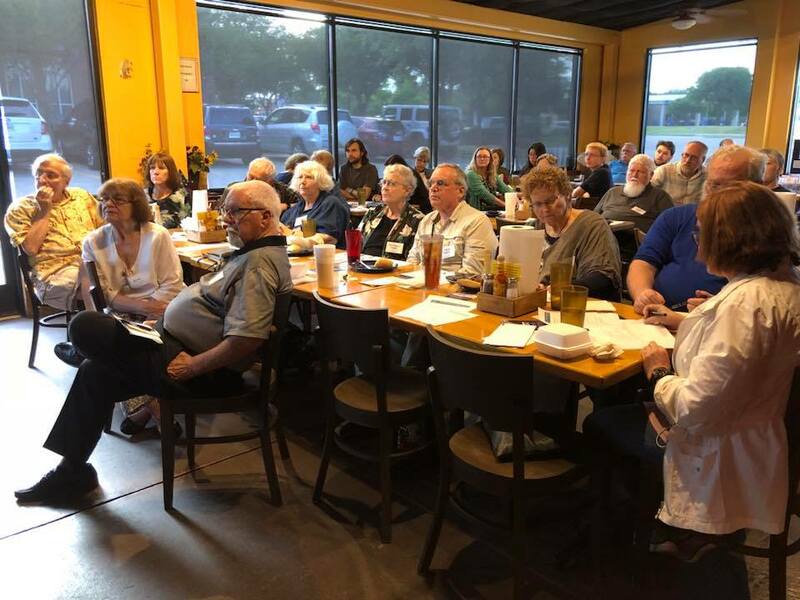 Texas CD32 candidate Lillian Salerno addressed the vital need to win CD32—to stop the national GOP leaders from tearing down the essential programs that help Texans’ lives. Lillian mentioned the three most important local issues as being healthcare prices, access to public education, and economic justice.